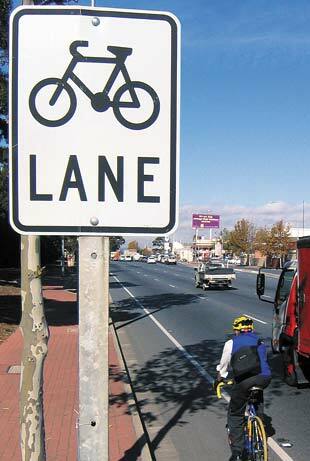 The South Australian Road Trafﬁc Act including the Australian Road Rules deﬁne the rules and responsibilities of all road users, including bicycle riders. The following page outlines rules that apply to bicycle riders and includes other relevant road rules. Some people will judge all bicycle riders by your actions. If you disregard the road rules, you can undermine the goodwill of other road users. When riding, you must wear an approved bicycle helmet that is properly adjusted and securely fastened. An approved bicycle helmet must comply with Australian Standard AS/NZ2063 which will appear on the helmet, and shops must not sell or offer bicycle helmets for sale unless they meet this standard. This also applies to any passenger that you may have on your bicycle. a red rear reflector that is clearly visible for at least 50 metres from the rear of the bicycle when light is projected on to it by a vehicle headlight on low beam. In deciding how close to the left side of the road or path is ‘reasonably practicable’, you should take into account factors such as obstacles in your path, lighting conditions at the time, and the quality of the riding surface. You must not cause a trafﬁc hazard (cause danger to yourself or others) by riding into the path of a driver or pedestrian. 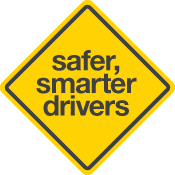 For example, if you move out to pass a parked car or avoid an obstacle without checking behind for other road vehicles, you can cause danger to yourself or others. You should only move out to pass a parked car or avoid an obstacle when it is safe to do so. You must not ride on a length of road or path to which a Road Access sign or a No Bicycles sign applies (see diagrams). These signs apply to all riders. You must give a hand signal when preparing to turn right, diverge right or when changing lanes to the right. However, when undertaking a hook turn, you do not need to give a hand signal (see Hook turns below). When riding, you must face forward and be in a seat designed for travelling on a bicycle. You must not ride the bicycle seated in any other position, e.g. on the handlebars or the crossbar. You must not carry more passengers than the bicycle is designed or equipped to carry. Most bicycles are designed to carry only the rider, however there are exceptions including child carrier seats, tandems and bicycle trailers. Extra persons are not to be carried unless they are in a seat designed for a passenger. You must always have at least one hand on the handlebars and have proper control of the bicycle. You must not be towed or hold on to a moving vehicle, including another bicycle rider. You must not lead (on a leash or any other leading device) an animal from a vehicle, including a bicycle. You must not ride within two metres of the back of a moving motor vehicle for more than 200 metres. Bicycle riders must obey the same speed limits as drivers of motor vehicles. No person can drink alcohol without affecting their ability to drive a vehicle or ride a motorcycle of bicycle. It is also an offence to ride a bicycle ‘under the influence’ (DUI). Every bicycle must have within easy reach a functioning warning device, such as a bell or horn. Bicycle lanes are for the exclusive use of bicycle riders. These lanes are indicated by bicycle lane signs or by road markings comprising both a white bicycle symbol and the word "lane" painted in white. The lanes operate during the times indicated. If no times are stated, they operate at all times. Green bicycle lanes are installed at intersections where there is a higher potential for conflict between motor vehicles and bicycles. They clearly highlight the boundaries of a bicycle lane and the road. If you are riding on a road with a bicycle lane, you must if practicable, ride in the bicycle lane. You may move out of the bicycle lane to avoid debris, potholes, or to safely overtake another bicycle rider. You must only ride in the correct direction in the bicycle lane. Where there is insufﬁcient room for two riders to ride abreast in a bicycle lane, as a courtesy you should try and ride in single file. During the bicycle lane operating times, you must not ride outside a bicycle lane abreast of another rider unless you are overtaking. driving a bus or taxi picking up or dropping off passengers (and then only for up to 50 metres). A bicycle storage area is a safety feature at an intersection with traffic lights to allow bicycle riders to be more visible to drivers. It is represented on the road with a white bicycle symbol and the area may be painted green. 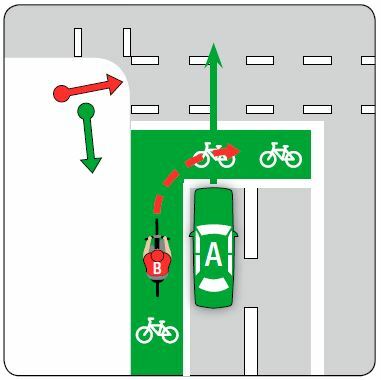 At a red traffic signal, bicycle riders wanting to turn left or go straight must keep to the left of the bicycle storage area (bike box). Bicycle riders wanting to turn right must keep to the right of the bicycle storage area (bike box). if the area forms part of a lane to which traffic arrows apply, any vehicle that is entering or about to enter the area at a time when those arrows are green or yellow. A bicycle rider must give way to all vehicles and not enter a bike storage area if the traffic lights are green. All vehicles in the left lane (including a bicycle lane) must give way to any bus displaying a Give Way to Buses sign and is indicating its intention to rejoin the trafﬁc flow. You are permitted to ride in bus lanes; however you should not obstruct a bus using the lane and ride as close as reasonably practicable to the left side. You are not permitted to ride in a Bus Only Lane. These lanes are usually coloured red and in South Australia most have a bicycle lane adjacent for bicycle riders to ride in. When there is a separate signal for buses (a white ‘B’ light) at an intersection, you must allow the bus to proceed on that signal. It is illegal for any other vehicle, including a bicycle, to proceed on the white ‘B’ signal. 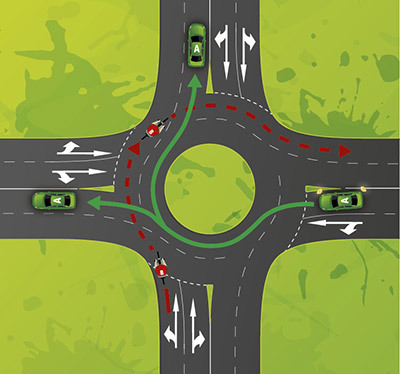 Like all motorists entering a roundabout, bicycle riders must give way to vehicles already on the roundabout and should look out for vehicles approaching the roundabout from the right. You may turn right from either lane of a multi-lane roundabout. However, if you are riding in the far left lane, you must give way to any vehicle leaving the roundabout. 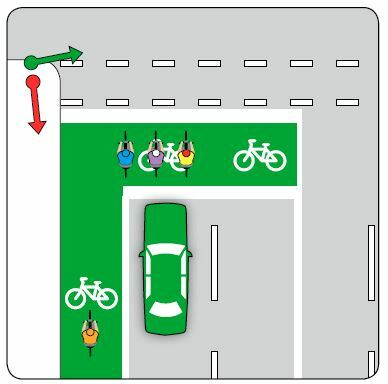 Bicycle riders in the far left lane of a multi lane roundabout must give way to any vehicle leaving the roundabout. you are overtaking (see Bicycle Lanes). Whether you are riding in a marked bicycle lane or sharing a lane with a vehicle, a bicycle rider must not pass or overtake on the left of any vehicle that is giving a left change of direction signal and is turning left. A bicycle rider may pass or overtake a vehicle on the left when the vehicle is giving a left change of direction signal and is stationary or moving forward to turn left. Once the vehicle begins turning left the rider must not ride past or overtake the vehicle on the left. 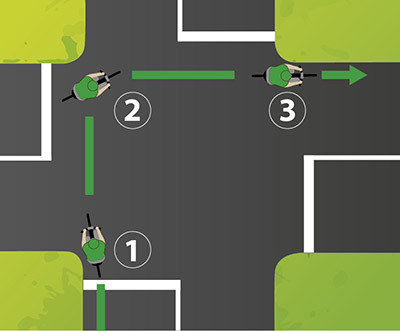 A driver turning left through a break in a dividing strip must give way to any bicycle rider travelling in the bicycle lane. A dividing strip is a painted area or a raised structure, located between intersections, separating the bicycle lane from a marked lane. Drivers must not overtake a bicycle rider and then turn left in front of the bicycle rider’s path without due care and consideration to the movement and safety of the bicycle rider. There are special rules that apply at children’s crossings (i.e. crossings with red and white posts and orange flags or flashing lights). All road users (including bicycle riders) must give way to pedestrians on children’s crossings. You must not overtake another vehicle that has stopped at a crossing to give way to pedestrians, either to the right or left of that vehicle. You must remain stationary if any pedestrian is on or entering the crossing. Bicycle crossings have been installed to assist bicycle riders to cross busy roads – the same way in which pedestrian lights assist pedestrians. If you are approaching or at bicycle crossing lights, you must obey the lights and only proceed when the traffic or bicycle light is green. When turning right at an intersection, you have the option of making a hook turn (from the left lane), rather than making a normal right turn. A hook turn may be more convenient on some roads, such as those with heavy trafﬁc. When making a hook turn, you must obey all trafﬁc laws such as only proceeding on a green light and giving way to other trafﬁc. 1. Approach and enter the intersection from the left side. 2. Move forward and wait on the opposite left corner. 3. Then proceed onto the road to which the right turn was to be made. This section explains the different types of ‘off-road’ paths available to bicycle riders and some associated rules bicycle riders must follow when using them. wear an approved bicycle helmet that is properly secured and fastened. give way to any pedestrians. Bicycle riders are allowed to ride on a footpath unless a No Bicycles sign is displayed. A bicycle path is for the exclusive use of bicycle riders and is identiﬁed by signs and path markings. There are an increasing number of paths that can be used by bicycle riders. In most cases, these are shared paths with pedestrians. These paths are identiﬁed by signs. A separated path is divided into sections, one of which is designated for the exclusive use of bicycle riders and the other for pedestrians. These paths are identiﬁed by signs and path markings and you must not ride along the part of the path designated for pedestrians. Some parks do not allow bicycle riding within their grounds. If you are unsure about bicycle access, you should contact the Department of Environment, Water and Natural Resources, or the appropriate local council or land owner for advice.